The Hardy Geranium has been a leading full service florist in the Austin and surrounding area for many years. Whether you prefer something time-honored and traditional or something contemporary and modern, we design our arrangements with you in mind. Carnations and baby's breath are only available upon request, contemporary designs of hydranea, peonies and other more garden to exotic blooms are used. At The Hardy Geranium, we will design breathtaking arrangements for all occasions from sympathy, weddings, anniversary, birthdays, and get well. We offer a vast selection of gift items such as Gund® plush and Vintage® pottery. 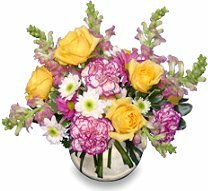 We are a full service florist specializing in country style designs. New home decor, window treatments, prints and wall decor are also available and make great gifts, also. Garden plantings and accessories are available spring through fall. Hanging baskets of outdoor annuals, patio pots and urns are a good item for spring to summer gifts. We are conveniently located on Fourth Street and Oakland avenue east and are open to serve your floral and gift giving needs. We deliver daily to all local funeral homes and hospitals. Our goal is to make your gift-giving simple and rewarding. Any questions or comments are greatly appreciated. Please call us personally and we will take care of all your needs.